Meant to inspire and ignite the child’s imagination, the Five Great Lessons are a catalyst for the Montessori elementary curriculum. Told too quickly, the lessons become meaningless, causing the children’s imaginations to jump from one concept to another. When we imagine, we are using abstract thought to think of things that cannot be seen. The follow-up lessons that come from each of the Five Great Lessons are used to materialize these abstractions. In other words, the children prove the existence of the wonders of the universe through concrete exploration. Isn’t that a great way to start a story? I get chills every time I start a story that way. And when you pause for dramatic effect, with the children gathered all around you, making eye contact with each child before you continue, you are making a personal connection and building the anticipation of what is to come. I like to present the First Great Lesson on the first day of school. This sets the tone for the whole year. I tell the story to a collective group near the end of the day, so the children go home thinking about the amazing story they just heard. In the beginning…there was darkness. The First Great Lesson begins with the idea that in the beginning there was nothing. Out of this nothing came stars, planets, earth, rock, oceans, atmosphere, and volcanoes. Known as the Precambrian Era, this is the universe before the existence of life. The Precambrian Era began about 4.6 billion years ago and represents approximately 80% of earth’s geological record. That is approximately 3.68 billion years! Even though there wasn’t any life, there was a lot of activity happening. And to rush through all of this exciting development in a day, or even a week, doesn’t do it justice. 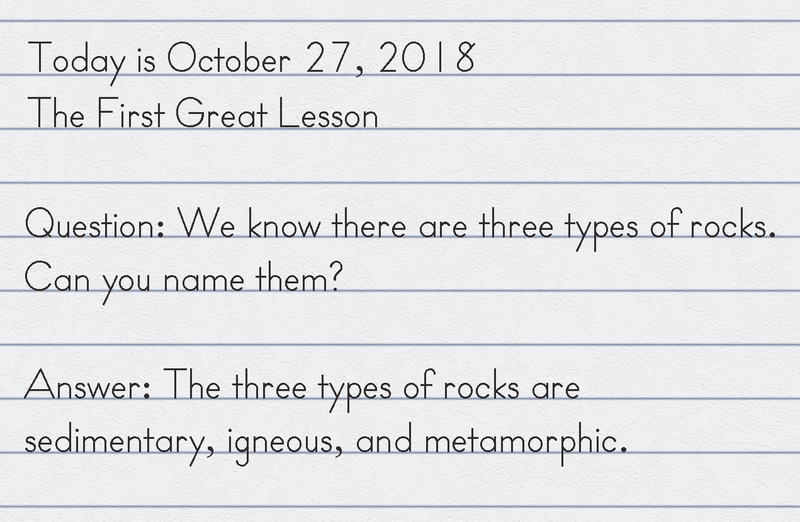 If the consensus is “rocks,” I write a question on the board related to that topic that will lead them to research: “We know there are three types of rocks. Can you name them?” I then invite the students to record this question in their cultural journals, including the date and a proper heading and using full sentences. We purposely begin with a basic research question like this one, so the students are not overwhelmed by the nature of the question or by the answer. The cultural shelves in the Montessori lower elementary environment contain all the research materials the students will need to find the answer. We often pair a younger student with an older student when answering the question, encouraging collaborative learning. It is okay for the older student to write the answer and the younger student to copy it into his journal, with the older student helping as needed. As we gather back together, students who wish to share what they have written may do so. We then use the next week or so to concretely explore the differences in sedimentary, igneous, and metamorphic rocks. As the students begin to exhaust their interest in studying rocks, we inspire them with a new topic. Volcanoes are very popular, for instance. 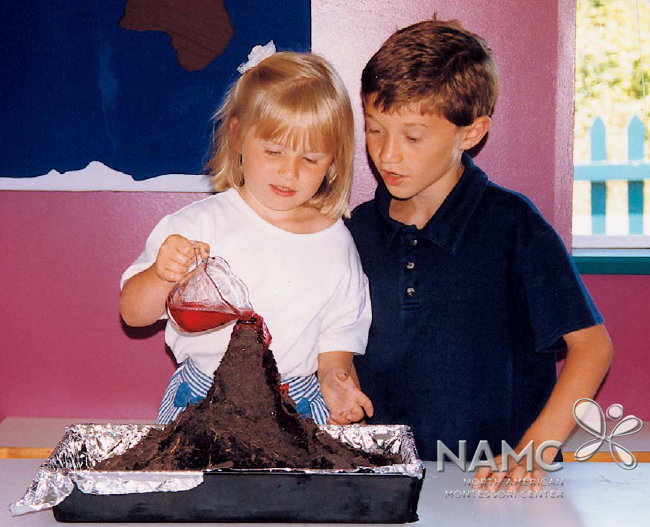 The students’ concrete exploration of the topic can lead to building active volcano models as part of scientific experimentation. They can also work with nomenclature cards to learn the names of the types of volcanoes as well as their major parts. Not all students need to be working on the same topic at the same time. Older students may have ideas about what they want to research while younger students are just learning how to conduct research. The Montessori teacher encourages students to use books and computers to gather research, take notes, and write reports. They are always asked to write their reports in their own words. Work that is copied directly from books or the internet is not their own. Even the youngest students are taught to avoid plagiarism. The Montessori teacher models paraphrasing and summarizing from the beginning so she does not need to reteach this very important skill later. 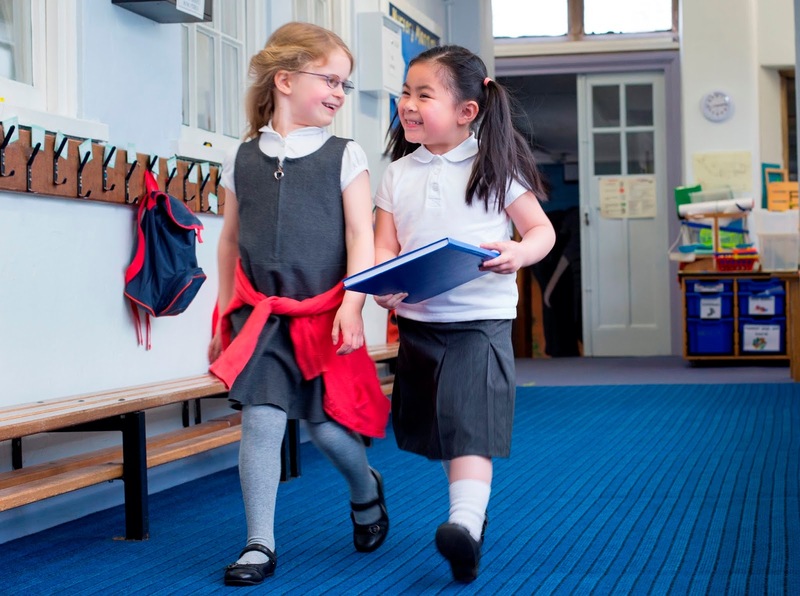 The child-led research that comes from the presentation of the Five Great Lessons directs the cultural curriculum in the Montessori elementary environment. You don’t have to, and likely would not be able to, teach all cultural lessons every year. Remember, you have three years to present the lessons found in the Five Great Lessons. After a few weeks of research, reports, models, art, and other explorations related to the First Great Lesson, the students will be ready to move on to the Second Great Lesson, continuing along the same way. What about Math and Language? There are two important paradigm shifts to make when we allow the Five Great Lessons to drive the curriculum. The first is that the Great Lessons come first. They provide the direction of your teaching and the timelines for learning. The second is that the Five Great Lessons are so important that they function alongside math and language. They are not separate or presented as rewards. 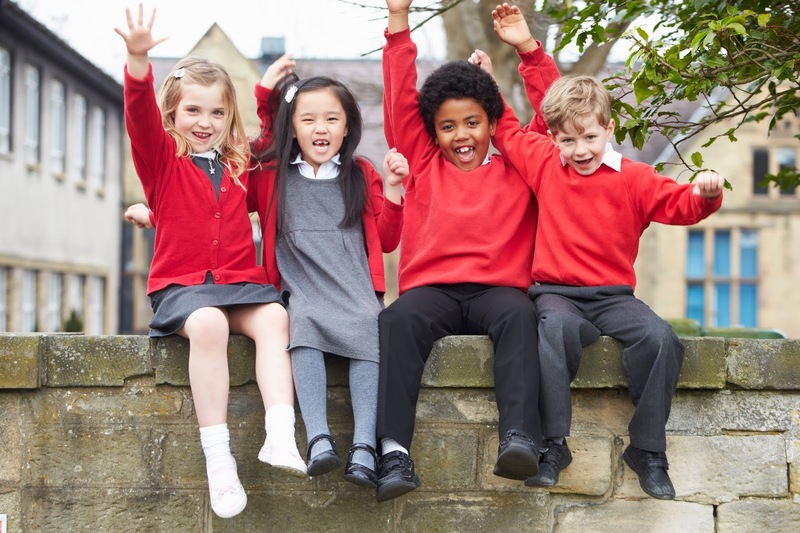 The Great Lessons are in fact the curriculum guide for the Montessori elementary classroom. The Five Great Lessons are included as part of NAMC's Lower Elementary Montessori Diploma Program. Learn more on our website. Morgan, Jennifer. Born with a Bang: The Universe Tells Our Cosmic Story. Nevada City, CA: Dawn Publications, 2016.